Ages ago I was given a Pottery Barn gift certificate for Christmas. I don’t happen to be a huge PB shopper so for years it has been kicking around, resurfacing every once in a while. We have packed and moved it several times around Brooklyn and out to NM and back. Basically, it is a miracle it hasn’t been lost. M&I finally decided we were going to get something… anything. 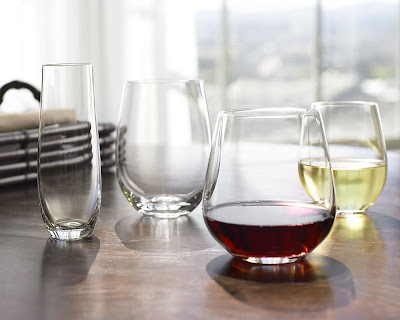 After circling the store a few times, almost deciding on something that we really didn’t want we saw these stemless glasses. We went for the red wine glasses although I have to tell you that I have and will continue to drink white wine from them. They are great. They are thin and feel so elegant. We even had $5 left over from the gift certificate. It is like it was meant to be.